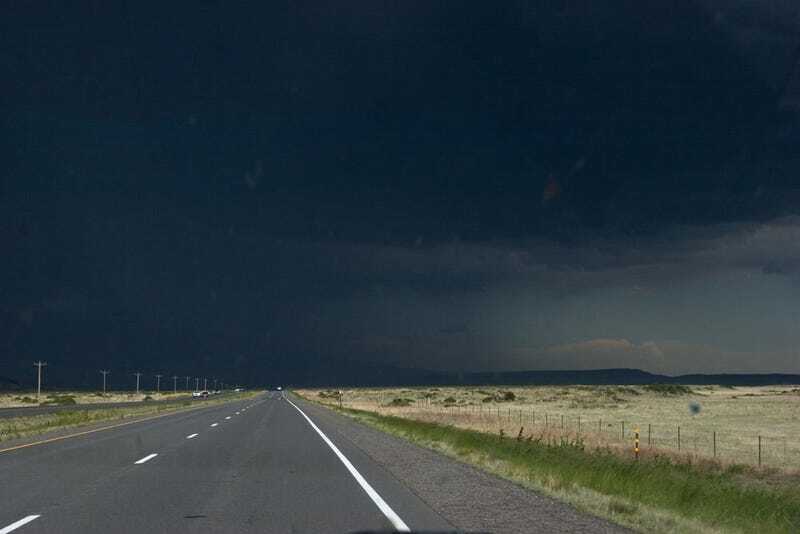 This was the view out the front window as we turned off I-25 at Raton in far northeast New Mexico and turned for the Texas panhandle. Fortunately, we only drove through the outer bands of this storm, and only got gusty winds and pea-sized hail. That wasn’t the end of the storms, though. As we approached Amarillo, numerous monster storms popped up all around us. As we neared I-40 at the town of Vega, TX, we were buffeted by 60 mph winds, but again, we were fortunate to avoid driving through the storm. Another storm has blown up back to the west where we came from, this one featuring 60 mph winds and tennis ball-sized hail. Luckily, that one should miss us too. Tomorrow is the last day of driving, and it’s a long one. Today, we drove for a bit more than six hours and touched three states. Tomorrow, we drive for eight hours and spend it all in Texas. The whole trip from Austin to South Dakota and back will end up being about 3,500 miles of driving. It was a blast, but I’m ready to be home.